Long ago, the ancient Greeks stared at the starry sky, creating entire mythologies around the superhuman characters they transposed over the light-bespeckled nightscape. These grand, elaborate myths were sophisticated, calendar-based creations that taught sweeping moral lessons for thousands of years. Today, emoticons are modern-day constellations in the sense that images are layered over existing keyboard characters to convey a feeling or emotion. 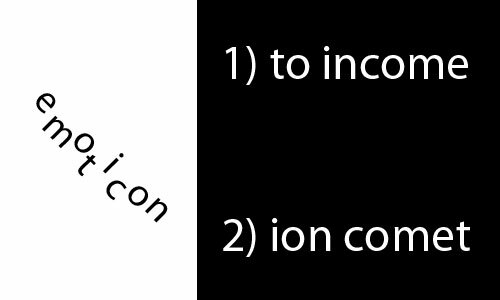 These small, simple symbols are trite, uninspired, lazily created characters that teach absolutely nothing to billions. We don’t know who invented the constellations, neither do we know who created the emoticons. The constellations were invented by Acydophylys, a small man in his late 20s with a striking unibrow. As for the emoticon creator, it was me. Actually, it wasn’t me. But I just found out who made them all up. Not only do I know who made them up, but did you know that emoticons have a secret, double meaning? In all of the Left’s condemnation of the Coke brothers, no one has ever uncovered what the rich brothers have been hiding from the emoticon-using masses, until now. Turns out, those billionaires are behind the cover-up and a leaky document has mistakenly fallen into my thousanaire hands. For example, I learned in the porous document that while everyone thinks “0_O” or “o.O” or “O_o” or “O.o” or “?? ?” means perplexed, they are all flat out wrong. With the exception of ?? 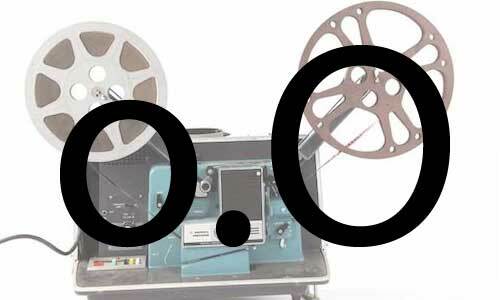 ?, the “o.O”s are actually – get this – filmstrip reels. …the movie’s about to end or the author is running out of patience with you. Put simply, the “o.O” or any of its sister emoticon counterparts are defined by the author’s general state of perplexment. First of all, I don’t appreciate the gender reference equating an emoticon to a “sister.” But what would one expect from the backward conservative Coke “brothers.” I also don’t like how they create a new word like “perplexment.” Is that how billionaires speak? I’m trying really hard not to like that word. Here are 9 additional emoticons with hidden meanings – so when you add the one I just gave you in the paragraphs above, it’s 10 total. If I’m still alive after posting, I will add all 784 of them, or so. If that statement shocks you, not the 784 part, I meant to add a small detail that I’m basically risking my life to post this. The Coke brothers are so powerful. Look what happened to Tab. You think this is a smiley face? It’s actually two UFOs hovering Blue Angels style between the earth and a waning gibbous moon. 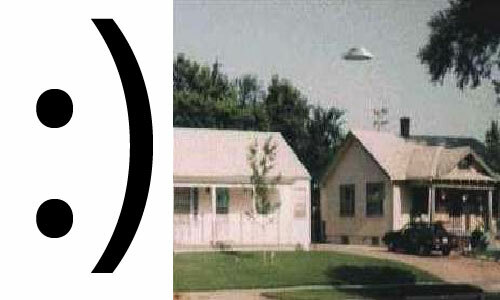 Every time it is used, a UFO is passing over your home. This is not the wink. 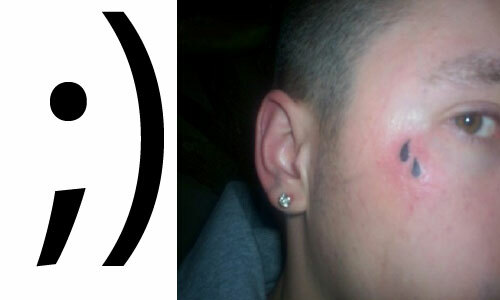 It is a person with a teardrop tattoo. It means the person who wrote it likely killed someone in prison. You think this is a smiley face with a nose. It’s not. 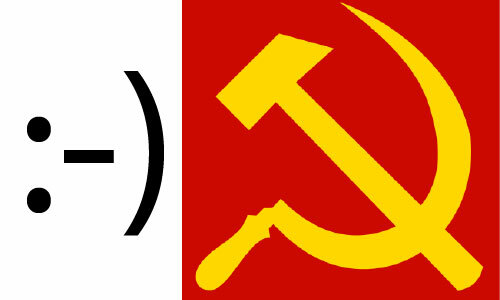 This is a Hammer and Sickle. The person who sent this is a card carrying registered communist. Forget about the cold war, the new breed is much scarier. And harrier. 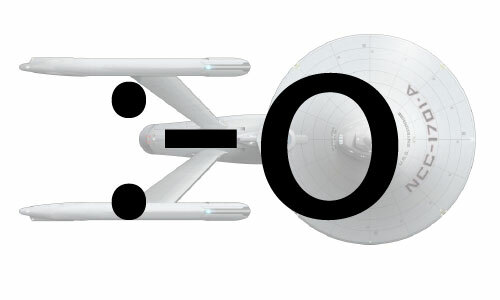 Thought to mean, “Gasp!” Really, this popular emoticon (which slipped to #12 in overall usage in FY12-FY13) is nothing other than the beloved Starship Enterprise. The Coke brothers are trekkies and sometimes play dressup destroying liberal planets ruled by static Klingons. The “J” turns into a smiley face in some computer systems. It doesn’t in mine. This one actually means my name, Josh. The person sending it wishes their name is Josh. If they are a woman they hope it is Jeanette, my Mom, who uses it often in her emails to me. Extreme happiness? NOPE. Under a microscope, the pixels in the curve of the letter “D” ——— oh wait, I can’t say that here. 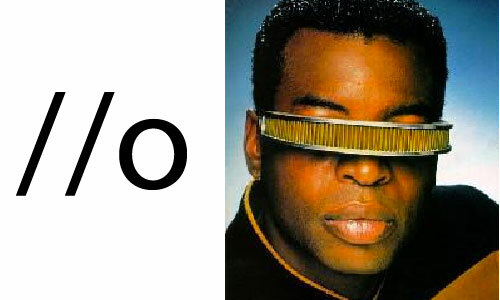 Back to the Star Trek theme, this is the emoticon representing the Reading Rainbow guy who wears those cool glasses during the ‘90s era TV series. I forget his character name and his real name, but I can picture him on both that show as a blind trekkie and the other show reading an award winning Caldecott book. This one is only used by the richest 1%. 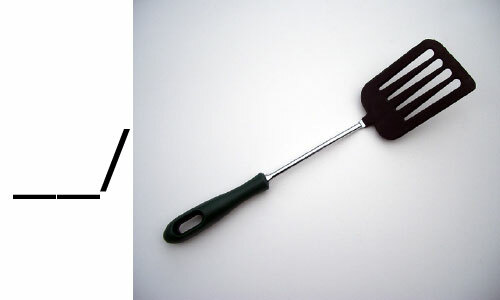 It is a spatula. The person sending it wants to be making pancakes. After all, they are human, just like you and me.